Happy Wednesday, everyone! I’m so excited to be sharing some of my spring favorites with you all today. Spring is one of my favorite seasons because it’s the light at the end of the cold winter tunnel (haha). When I lived in Miami, I never really noticed a change in seasons. But now that I’m in New York, I get giddy at the thought of finally being able to wear spring clothes! It’s so hard to switch things up with your style when you always have to wear a turtleneck or a coat and jeans. 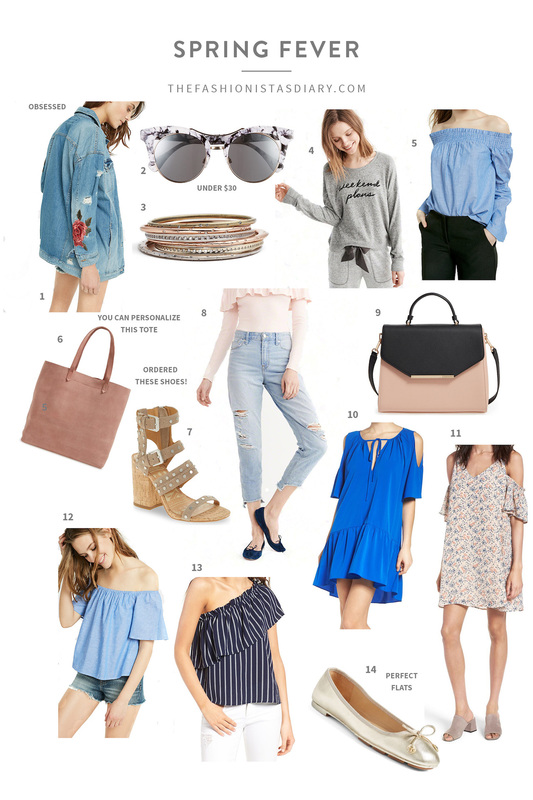 So, to keep myself sane, I spend a lot of time looking through the web for the best (and affordable) spring pieces that make my heart skip a beat. Below, find 14 of my favorite new arrivals that will be sure to make a new home in my closet… soon. Also, make sure to head to the end of the post for a little life update! Earlier today, I ordered these in two colors. They remind me of the Isabel Marant ones but they’re a fraction of the cost. I actually love this shoe brand so much and have so many pairs from them! I can’t believe that this top is only $35. Like what?! It’s so cute for spring with white ripped jeans! And speaking of jeans, these are on their way to me and I couldn’t be more excited! It’s safe to say that I had to hold onto my credit card today while searching the web because I wanted basically everything, especially this because it would make a perfect Easter Sunday dress! My mom also loves me in this color so maybe she’ll read this and get this dress for me #onecanonlyhope. When I graduated college, I already had a job and was so excited to embark on a whole new journey. I was moving to a new city, had a new job, new apartment, whole new lifestyle. Of course, one doesn’t anticipate for something to go so wrong, but it happens. Over the years I’ve realized that a lot of unfortunate crap happens to me. That’s the truth. But I would be lying if I said that each misfortune didn’t lead to me growing as a person and learning more about myself and this crazy world we live in. I didn’t anticipate hating my first job out of college so much. I didn’t expect to find myself waking up sick and anxious every morning at the thought of having to go into an office. But, things happen. Life happens. When I first got the position at IT Cosmetics, I was over-the-moon excited. I couldn’t believe that I had 1) gotten a job and 2) gotten a job at a huge beauty company. I remember getting the offer letter and being so excited. I was never someone who got straight As. It’s hard for me to study because my memory has become foggy ever since the fibromyalgia came about. So I got frustrated so many times during my college career, especially when I saw others excelling. But I always tried hard, had a job, worked on my blog and kept a positive attitude. I knew that once I graduated, it would be my time. So getting that job offer was proof to myself that I was good enough. Fast forward to my first day. Everything went well. Sure, I was overwhelmed. But who wouldn’t be?! I sat at my new desk, with my new laptop, new coworkers and tried to settle in. A quick background for those of you who don’t know me personally: I am a very outgoing person. I’m passionate about what I do and I put 110% into everything I work on. I voice my opinions (respectfully), participate in conversation, become friends with people and acclimate well. I was hired for this job because of my personality, the life I brought to the company and the ideas I had already started to come up with. For the first few days, it was fine. I was really happy! But then came the first meeting where I was told that I needed to keep my mouth shut and not talk. That it wasn’t my place to participate in conversations around me, that I wasn’t allowed to give ideas yet because I didn’t know anything yet. Red flag number one. Oh, and the fact that I thought I was entitled because I had a fashion blog. Mind you, whenever someone mentions to people that don’t know me that I have a blog, I get embarrassed! It’s not something I go around bragging about, so to hear that was so hurtful. To be told that I couldn’t be myself in a place where I would work at for 40+ hours a week put a real damper on my mood. Needless to say, I got home that night and felt defeated. After that, nothing was the same. I was constantly called out for things that were unnecessary, I wasn’t taught anything (instead told to quote-on-quote Google it), I was ostracized, bullied, treated like an intern and given no respect. I was then told that I wasn’t being myself when I was told NOT to be myself in order to get acceptance from my peers. I was called out via email with my whole team CC’d, made fun of and felt so uncomfortable that I would go home sick and tired. My mood changed and I was no longer happy. I didn’t want to talk to anyone, I didn’t want to blog, eat, go out, nothing. That’s when I knew. I know that it wasn’t me. It was my boss who was unhappy and she took it out on the new, vulnerable employee. When people are so unhappy with their lives, they will do anything to make sure you aren’t happy. For me, I’ve always been taught that you need to be happy in life in order to succeed. This toxic environment was not only stripping me of my happiness but stripping me of the person I have spend 23 years being. Leaving there was the best decision I’ve ever made. Yes, it was after 3.5 weeks. No, I am not a quitter. I am simply someone who respects her happiness and believes that I bring so much to the table that it is unfair for someone to kick me to the dirt. I wrote down everything that happened to me during that short time and the list took up a whole page of a notebook. So, no. I am not a quitter. I actually think I would have been a quitter had I stayed because I would be giving up on my right to be happy and comfortable. Let’s just say it was so bad that they didn’t even make me give 2 weeks. I was able to leave that same day... that same moment. I’m now working part time at a brand marketing agency and going to strongly pursue TFD on the two weekdays I have off a week with the help of my mom. I just decided to switch from full time to part time because it’s time that I do what I love and grow it. I’ll be incorporating more lifestyle, personal and NYC-related posts as well as starting up my YouTube channel again. So, I guess you can say it was a blessing in disguise. While it was probably one of the worst months of my life, it allowed me to realize what I deserve and that no one has the right to make me feel unhappy. Thank you for being patient during this relatively rough transition. Thank you to those of you who have stood by me through this crazy process and who have been such loyal TFD followers for years now. Every supportive comment and message has proven to me that this is what I’m supposed to be doing. I love you all! Thank you so much! I agree! And I can’t wait to start introducing new and fun content!!!! You are seriously one of the sweetest people, ever. Thank you for being so supportive all of the time. Your comments ALWAYS make me smile! I hope you have a beautiful day! Happiness is definitely a priority, and realizing that at your age is so critical. Many new grads are willing to sacrifice that and wind up burning out and miserable. Stick to your guns and find your bliss! I completely agree. I see a lot of my friends getting all of the crap work for no reason and being worked overtime with no pay and it’s not fair to them at all! Thank you so much! I’m so sorry to hear that about your first job! I was in a similar situation to you when I got my first full time job out of college. I actually cried weekly and the things my boss would say to me. It’s crazy how a person can be SO rude and ruthless to another person! Beautiful! First of all, congrats on your blog!!!!!! So excited! and second, thank you so much. So happy to see you’re now so happy at rS. It seems like a great company to work for and you’re obviously amazing at what you do. Hope to see you soon! I won’t be at the rS conference this year but if you’re ever in NYC, reach out! Aww, thank you so much!! 🙂 So sad to hear you won’t be down in Dallas, but we’ll definitely have to grab drinks next time i’m up in the city! Wishing magical things for you in the future – you deserve it! I was in a similar situation once. My boss was new, stressed, and overwhelmed. The company culture was toxic. They made it clear day ine you were expendable. She didn’t take care of her employees, just tried to blame us and protect herself. You are such an inspiration! You have so much potential to grow allGLAMMEDup! And it’s so hard. I think you need to eventually leave there if it’s even making you sick. That’s how I was. I wouldn’t eat or sleep and I didn’t want to talk to anyone… it was horrible. Sometimes you have to do what’s best for YOU and what makes YOU happy. And yes, through God we can do anything. I love all your picks! So glad you are happier since you left your job! 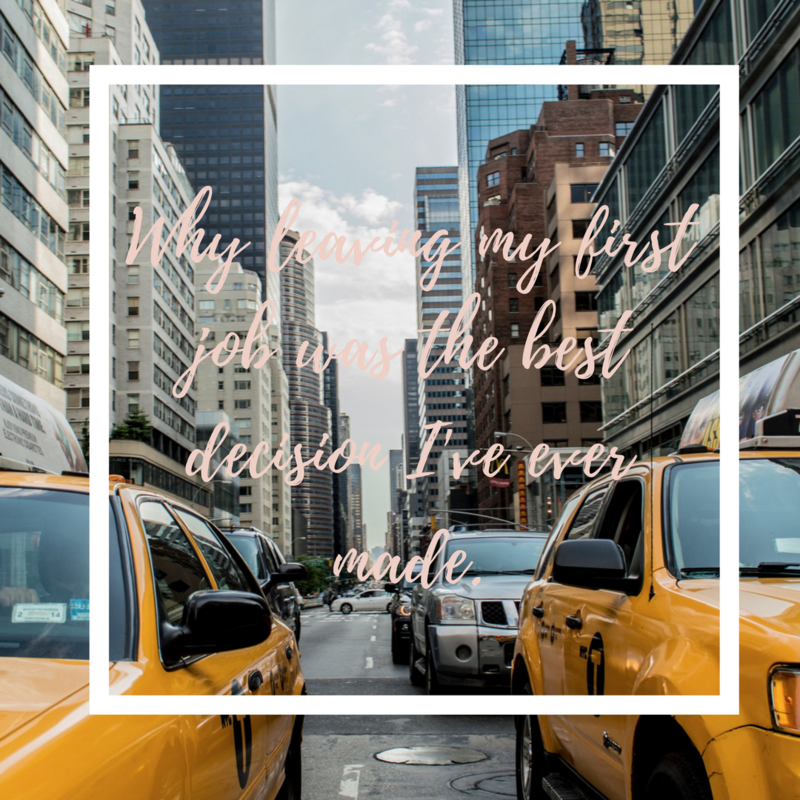 I had to do the same thing when I first started working and it was one of the best decisions I ever made! Happens to the best of us, and choosing yourself means you won! Wishing you the best of luck in all your new endevours! Loved reading this story, it truly does seem like a blessing in disguise. Absolutely no-one has that right to make you unhappy. Good for you, girl. Thank you so much! I am so giddy just thinking about the fact that I will have more time for TFD! Reading the story about your job hit SO close to home. I’ve been in terrible work environments just like that more than once and it’s the most debilitating and frustrating feeling. It’s like being trapped and I hated it. I’m really glad you were able to leave that hostile place and go somewhere that you could be yourself and still have time for what you love. You’ve got this, girlfriend! SO many pretty things! I’ll take one of each! Oh my gosh, I’m sorry that happened to you. It’s so unfortunate but in the end, your full-time job is honestly where you spend MOST of your time during the week and if you’re not happy there, it will definitely make everything else worse. And at least you got out while you could! Wishing you the best of luck with your new position and hang in there!! What an awful way to start out your “adult” life, but unfortunately things like that happen in the real world more often than you would think! Luckily you made the right decision and didn’t allow it to happy any longer! i’m so excited for your new endeavor and wish you the best of luck in NYC, friend!! How horrible, I’m so happy you left that awful place. I love your blog and I’m so happy I found it. You have great style and your blogs are so nice to read. Good luck! The important thing is that you’re taking the blog PT which is very exciting! Loving all of your picks and enjoyed reading your story!